SIAM-IS14 will exchange research results and address open issues in all aspects of imaging science and provide a forum for the presentation of work in imaging science. 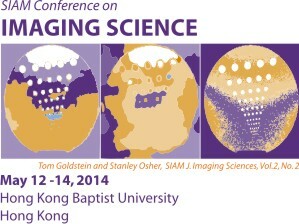 This conference is the biennial activity of the SIAM Activity Group on Imaging Science. If you are tweeting about the conference, please use the designated hashtag to enable other attendees to keep up with the Twitter conversation and to allow better archiving of our conference discussions. The hashtag for this meeting is #SIAMIS14.